Gushes forth a sea of grace from the grave. Our holy Father Thalassios was from Libya in Africa, and both a priest and an abbot, who lived during the reign of Constantine Pogonatos (668-685). He was an ascetic author, whose four centuries titled On Love, Self-control and Life in accordance with the Nous appears in the Philokalia. This is his only known writing. 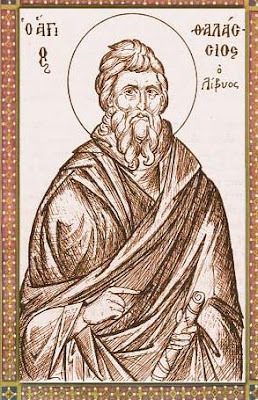 He was a personal friend of Saint Maximus the Confessor, whose largest work, To Thalassios: On Various Questions Relating to Holy Scripture, consists of answers to difficulties raised by Saint Thalassios. The Two Hundred Texts on Theology by Saint Maximus are also dedicated to Saint Thalassios, and in addition five of Saint Maximus’ letters are addressed to him. Twice Saint Maximus describes himself as a disciple of Saint Thalassios. Perhaps this is no more than an expression of courtesy towards someone older than himself, and it may have been Saint Thalassios who was in reality the disciple: but it is not impossible that Saint Maximus was indeed decisively influenced by him. Saint Thalassios, like Saint Maximus, sees self-love as the source of all the vices, and the two agree in emphasizing the supreme importance of love. He reposed in peace in the year 648.